There were more hotels to see before our late afternoon flight to Bagan, arriving in the evening. Bagan is even more years backward. On the road from airport to the hotel we were travelling in darkness with no streetlight along the roads of old Bagan. We checked in the 5* Tharabar Gate hotel. This is a beautiful hotel built in Burmese style of teak wood with rooms set among the beautiful tropical gardens. The evening dinner was set with tables for dining on the terrace of the swimming pool. It's a lovely setting. We are choosing this hotel for our deluxe hotel. 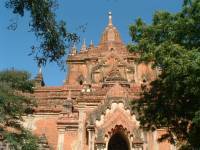 Next morning we started the full day tour of old Bagan, the archaeological zone. 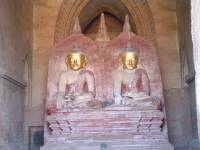 A vast area of thousands of sites with pagodas & temples, some with large Buddha images or figures inside. 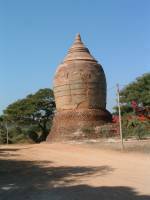 There are many pagodas in various sizes built by people as shrines in memory of their people. These shrines are everywhere, resting close to each other it is an amazing sight. The sheer numbers of them scattered among the jungle makes for a fantastic view from high up. We started with Ananda Patho, the temple with four entrances & each with a large standing Buddha. The South & North entrance still has the original Buddha, the East & the West are replacements for those destroyed by fire. Next we visited Shwegugyi, a small temple with fine stucco carving & Thatbyinnyu Pahto, one of the highest temples. From this temple a wonderful photographic view of the surrounding sites. We also visited Dhammayangyi Patho, Htilominlo Pahto, Shwesandaw etc. Lunch was at Bagan Green Elephant River View Restaurant. This time the restaurant setting is in an open garden facing the river, a beautiful outdoor setting with lovely Burmese food & Myanmar beer. The menu today consisted of tempura squash & watercress, lentil soup, mixed vegetables, aubergine, chicken curry & pork curry. After lunch, we inspected the Bagan Thande hotel, the Thazin Garden Hotel & Thiripysitraya Sukura before we returned to old Bagan for the sunset view from the Mingalar Zedi temple. The evening dinner was held at Nanda restaurant in the courtyard with the very popular Burmese Puppet show on stage. The meal started with a soup followed by an individual large tray on which was served a variety of main courses in separate sections of the tray, included chicken & beef curries, aubergine, assorted vegetable, fried dried shrimp paste with chilli & coconut rice. An evening of entertainment. An early morning start for our flight to Mandalay.